As a user experience designer you work towards improving the quality of user interactions and increasing the overall user satisfaction with a product. These are qualitative outcomes and your job is to continually enhance them. But, in the UX design practice, we need to quantify those outcomes somehow so we can measure and improve them. This means you need to understand exactly what users are doing, how they are using your product, and how they are feeling while using your product. The best way to do that? Focus on the right set of measurements or UX KPIs and figure out how to best capture them through user tasks and interviews. Following are 5 of the key metrics that can reflect user behavior and serve as a good indicator of potential usability and user experience issues with your product. Now, let’s go through each of the metrics and see how we can measure them. Known also as success rate, this metric represents the percentage of users who successfully completed a task. It’s an important metric because it shows how effectively users are able to complete a certain task. The type of task will depend on your product and it can be as simple as asking users to fill up a form. As long as you create a realistic task with a well-defined goal, you’ll be able to measure the success rate. But what about failure? Task completion won’t tell you much about why users fail, but if they can’t finish the task, it means there’s a serious friction in the user flow and this is something that demands your immediate attention. 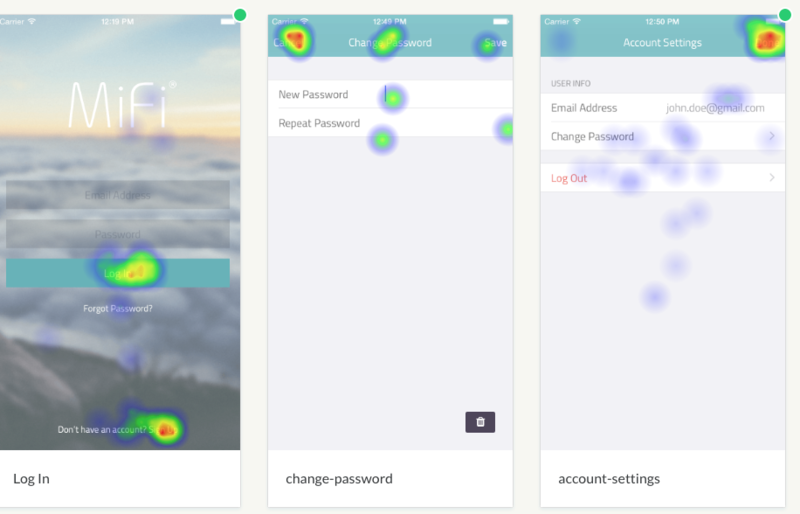 If you’re using a usability testing tool such as Koncept to perform usability tests, you’ll be able to see where users got stuck by looking at the heatmaps. How much time did it take users to complete the tasks? Time on task can be analyzed in different ways, but UX designers most commonly look at and report the Average Time on Task. This is the total amount of time users are spending on a given task. In every scenario, except when a task is meant to keep users engaged, a long task time is a signal that there are some issues with interaction with the product’s interface. As a rule of thumb, the less time people spend on a task, the better is their experience of using the product. You can use the time on task data to reduce the number of steps a user needs to take to successfully complete the task. If you can show that your design iterations reduced the time it takes users to complete a task - both development and business teams will easily see the impact and the ROI of user experience design. The user flow you design can be ideal in theory, but users will almost certainly find different paths through your product’s interface to complete a task. The only thing they want is to accomplish their goal with the least amount of effort. So they’ll naturally want to complete a task with the least amount of steps. This is also something you’ll want to see in your usability test results! Now, how can you see what steps user took to arrive at a solution? If you are doing in person tests, you can observe and record users. You can also use a usability testing tool that allows you to track user steps via heatmaps. High error rate is something that all user experience designers dread. The error rate can tell you how many mistakes users made and where they made them while interacting with the product. But in order to get meaningful results, you’ll need to define which actions constitute failure first. Error rates can give you invaluable insight into where your weak points are and what might be the reason for them so you can optimize the design accordingly and reduce the number and frequency of errors. This is a purely qualitative metric and you can’t measure it via usability tests. What you can do though is conduct user interviews or (if you really have to) run a short survey after the usability study to uncover user sentiment. You’ll want to know how satisfied they were with the user interface, what was the overall ‘feel’ of the product, what they thought about the performance, etc. This information is not easy to collect but it holds incredible value. Tools like Qualaroo can be a good choice for helping you gain more quantitative data based on user feedback. The right UX KPIs will help you quantify the progress you’re making through design towards delivering truly meaningful user experiences. Your executives will also understand the impact and the ROI of design changes that directly address usability issues and bottlenecks uncovered during testing. We’ve discussed 5 main UX metrics to track but you can and should define a set of specific metrics that will help measure your product UX more effectively.